Gabrielle Wells, along with her father, recently returned from a mission trip aimed at bringing medical relief to the country of Belize. Gabrielle has been inspired by her father, the CEO of the Diabetes Foot Center Group, who has demonstrated to her, unrivaled passion for helping people with diabetes. After seeing the number of patients in need of amputations as the result of the condition, her father began the Diabetes Foot Center Group to help educate people and to reduce the number of medical procedures that could have been prevented if people were informed. 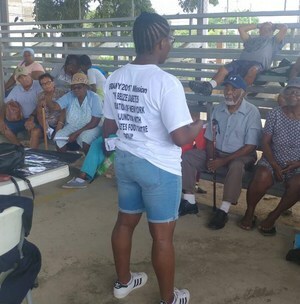 This summer, Gabrielle, an aspiring nurse, joined her father in Belize where she was able to work closely with a nurse practitioner and experience first hand what the job entails. She became well-versed in medical terminology and even learned how to teach patients about having a balanced diet. In total, the group saw 301 patients, many with difficult circumstances. Gabrielle was particularly moved by one patient who, after having her painful foot wounds attended to and who could hardly stand, proceeded to mount her bike and start on her 2 hour trek back home to her small town. "It was very humbling to see the unfortunate poor conditions of these people that needed medical help, but it felt amazing that we could help them."